Everybody knows bananas are chock full of potassium, but what else can they do? Do they have any other benefits that make them worthwhile? Here’s a handy list of reasons you should keep on (or start!) buying those bananas. Bananas have about 3g of fiber! This can help you stay fuller for longer and keep all your digestive processes healthy. They’re low in calories! A medium size (7 to 8 inches) provides on average 110 calories. They provide a great source of vitamin B6! One banana will provide about 35% of your daily requirement for B6, which is important for the growth of new cells. 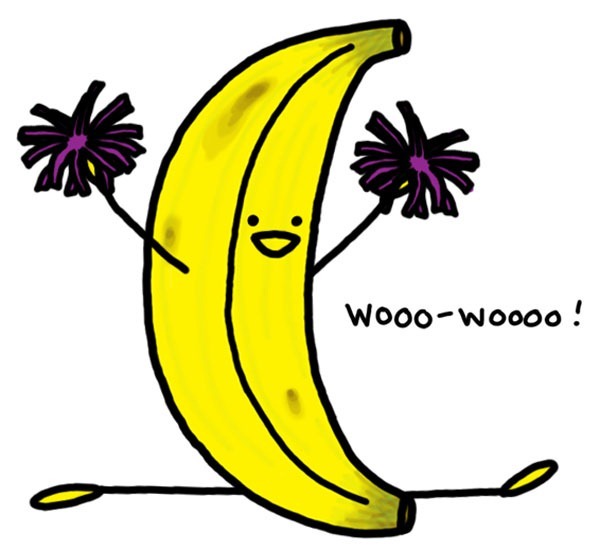 Bananas contain carbohydrates! Carbohydrates are our body’s primary source for energy, which makes them essential in our diet. One medium banana can provide around 27g of carbs. This makes them a great addition to breakfast, post workout fuel, or just a snack anytime during the day. Bananas make great additions to smoothies! Throw some ripe bananas in the freezer to use for smoothies anytime. They make a great ice replacement so your smoothie doesn’t get watered down, while providing extra nutrients! Frozen bananas can be turned into ice cream! Just grab the frozen bananas and put them into a food processor or mixer, and blend until you reach an ice-cream-like consistency. Be sure to chop the bananas into bite-size pieces before freezing to make life easier for you and the mixer! A delicious idea, courtesy of my roommate, is to add some peanut butter while blending and drizzle chocolate syrup on top. Bananas are cheap! As college students, we are all familiar with a strict food budget. Bananas typically cost around 50-60 cents per pound, depending where you buy them. Keep an eye out for the overly ripe bananas; many stores sell those at a discount, but they make perfect freezing bananas for ice cream and smoothies! And finally, bananas are perfectly portable! Bananas are the best snack to grab on the go, because they grow naturally in their own containers! Bring one to class, in the car, to a movie, on a hike, to the gym, or anywhere else you can think of!